How Long Has The Lord Helped Me? Last week we how talked about important it is to STOP and recall the Lord’s hand. The reason? Because if I don’t REMEMBER, I will FORGET. I am not sure why challenges are called “pickles” but the saying is firmly established. And if I work life out my own way, not looking for and remembering God’s hand, I might find myself drowned in vinegar and covered in dill. The problem with us humans is we are forgetful creatures. If we don’t record God’s work and play it over again and again in our minds, we disregard how much the Lord does for us and how much we need Him. We figure we can work everything out ourselves. We take credit for our successes and find a culprit for our failures. We make plans without asking our Creator’s plans. We move forward in pride and blindness. And before you know it, we get ourselves in a pickle. This week we are asking ourselves a question taken straight out of 1 Samuel 7: How long has the Lord helped us? The Philistines not only defeated the Israeli army in battle, but they also captured the Ark of the Covenant - the visible representation of Yahweh’s intimate hand in His people’s lives. The Isreaelites were devastated. Not only were they now ruled by the hated Philistines, but also the Holy of Holies in the Tabernacle stood empty, and would for many years. As often happens in hard times, the people began to regret their abandonment of the Lord and doubt their self-reliance. They want to return to life with God. As soon as His people turned back to Him, the Lord fought their enemy and defeated them. The Israeli army didn’t throw a spear or lob an arrow. Everyone rejoices, praising the Lord for His miraculous hand. For the moment, it is all praising God and throwing away idols. But how long will it last? How will the people remember this time? What will prevent them from forgetting again? Samuel wants the people to GET IT so they won’t return to their sinful past! To help them REMEMBER this time, Samuel places a rock memorial up and calls it Ebenezer: Till now the LORD has helped us. We don’t know what Samuel’s Ebenezer monument looked like. But rocks are an excellent way to remember God’s hand: sure, solid, steadfast, sturdy, and permanent. The best part of this story may be that the spot of memorial was where they originally lost the battle twenty years before. In First Samuel 4:1, we see the name of the place the Philistines defeated them is Ebenezer. Their worst memory, the most tragic event, the greatest defeat -- THAT is where the memorial to the Lord is placed. Well, I think it is because Samuel wanted them to understand that when they abandoned God it eventually led to defeat. BUT, even then they are not left alone. Their worst failure could become their greatest display of God’s power, when they turned back to Him. EBENEZER means “stone of help.” We don’t know what the location had been named before the memorial. From the moment that rock memorial was placed there, it renamed the defeat. 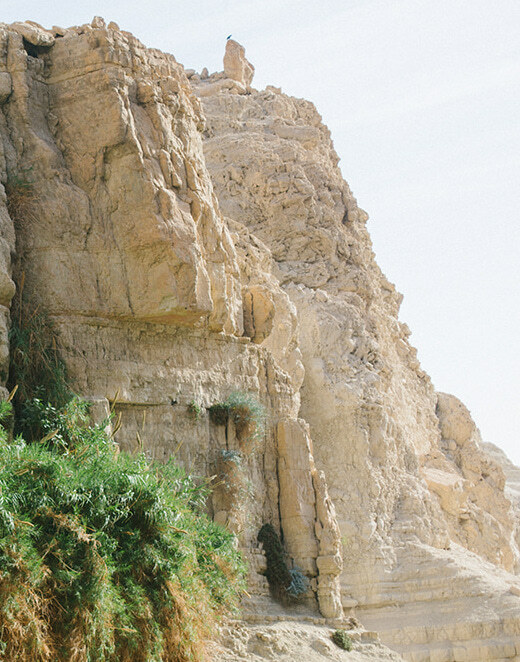 No longer the place of sorrow, it was the place Yahweh HELPED His people. When Samuel places and names the memorial, he says, “Till now the LORD has helped us.” He wasn’t just memorializing how the Lord had helped in that battle, but also every single point of assistance from the first moment of His work in His people until then. He is saying, “From the day God called Abraham out to begin His people up to this moment, 900 years later, TILL NOW, the Lord helped us! As the Israelites needed an Ebenezer, a memorial, to remind them that it has ALWAYS been God, I need my own Ebenezer. I must REMEMBER or I will FORGET. Here’s my reality: every moment from my past up until the breath I now take, my Lord has helped me. From the moment He called me His own, TILL NOW, He has helped me. But I easily forget this truth. I either take credit for my accomplishments or blame God (or someone else) for my failures. How can I concentrate on His hand, so I will REMEMBER? What if we became a people WOKE to the power and presence of the Lord in every moment of our lives? What would change if we focused on His hand rather than our lack? What if we zeroed in on His power instead of our difficulties? What if we recalled the ways He helped us in the past instead of bemoaning that things haven’t worked out in life as we planned? What would happen? Why don’t we find out? Once I stop long enough to remember all He does, and then ask myself “How long has the Lord helped me?” -- then I come to the realization: EVERY SECOND OF EVERY MOMENT. That’s how long He has helped me. Without the Lord I would be lost. I invite you to join me for the month of January, 2019. We will work at remembering the ways God has carried and cared for us from the moment we turned to Him “till now.” We will remember so we never forget. Sign up below and get access to this free printable list. Hang it up or stick it in your Bible and write down everything that comes to mind about the times the Lord has helped you. Don’t be surprised if it fills quickly — just print another one and fill it up too! Every one of the 31 Days of January 2019, a new blog post will lead you through scripture and ideas to help you recognize and see all the ways the Lord had helped you to NOW. You can come to the blog every day, or if you sign up below the post will be delivered directly to your inbox every morning of January. Want to get started before January? You could warm your brain and heart up for our remembering exercises now by starting a list titled: Ebenezer List. (Sign up at the link below for a print out to use.) Write as many items as you can REMEMBER of ways the Lord has helped you, led you, or provided for you. Put the list somewhere you can easily find it and add everything that comes to mind. Next week I will share how looking back can give us the hope to look to the future with faith. 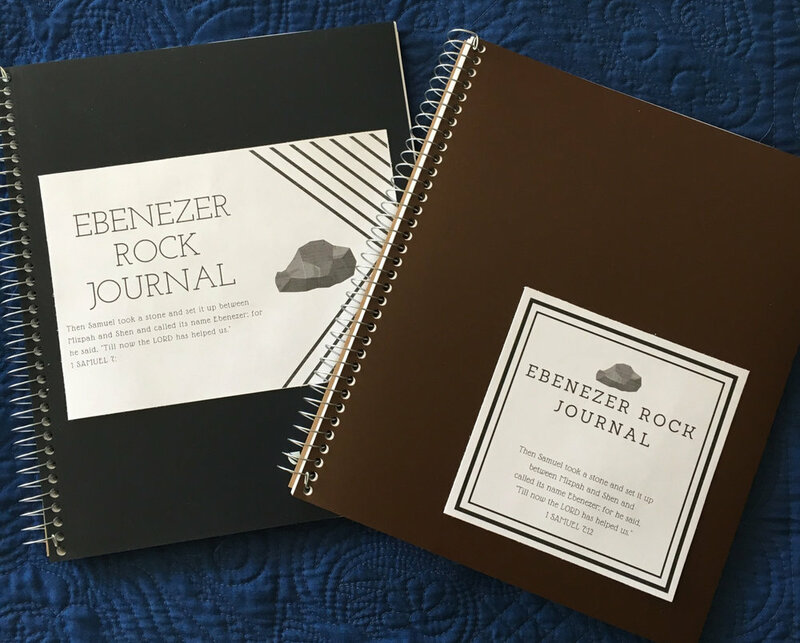 Sign up below for not only the Ebenezer List print out, but also get these journal labels as well. Choose your favorite and attach it to the front of a journal or notebook. OR — just take a marker and write EBENEZER JOURNAL on the front. Often, the easiest way is the best way! Ebenezer Journal: I suggest buying a simple notebook to journal through the 31 Days. Write down the memories of when God has helped you. This memorializes them and builds your own Ebenezer Rock. 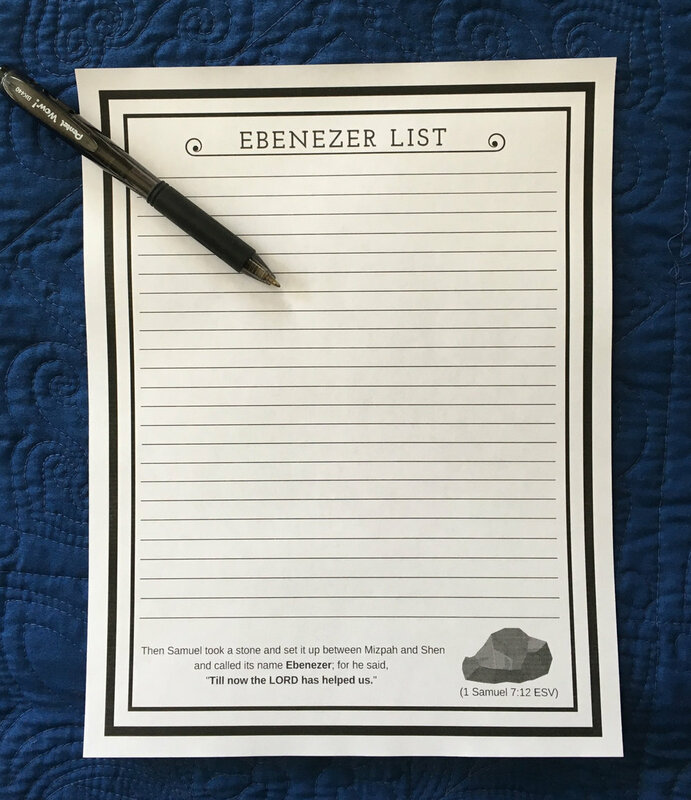 Ebenezer List: Write Ebenezer List on the top of a piece of paper or use the printable. Write down everything that comes to mind. Ask the Lord to help you remember. Put the printable somewhere handy so you can write down each item as it comes to mind. Family List: start a family Ebenezer List too. Hang it somewhere prominent and encourage everyone to add items to the list whenever they think of something. 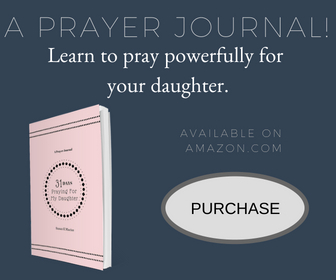 You are developing awareness of the Lord’s hand in your kids. Sign up here and you will get a link to a page that has the printable above. 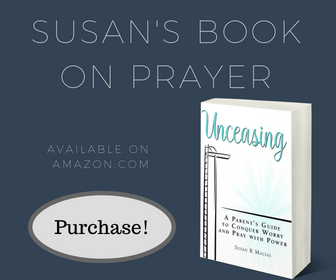 You will access to all the resources created during this series as well as previous Prayer Guides I have made. All for free!